Mornings are the worst and I mean really bad. I take the Meloxicam at night in the hopes that the drug will be in my system and working to ease the pain of getting out of bed. Some days are worse than others, but I still sit on the edge of the bed dreading the need to stand up and get going. By evening, it's not so bad and I'm not exactly sure why. I don't feel that a great deal of progress beyond last month's assessment has been made. I was trying to resign myself to always having some pain when I remembered a post in the blog, "Smile and Wave", which is to the right. It was back in July and the blog author talked about how she and her husband were using an amber teething necklace on their daughter. They were positively sold that the necklace was helping her get through this difficult time. I had never head of this before. July was a painful month, although it could be said that all the months are painful, just in varying degrees. So, I did some reading. As we all know, the Internet can be the source of great information or it can pull you so far down the rabbit hole, you'll never get out. 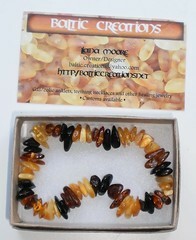 I read everything I could find about amber, but not just any amber, it has to be "Baltic" Amber. This kind of amber has succinic acid in high quantity. This is an anti-oxidant that helps the body's immune system repair. The use of amber for medicine can be traced back to Hippocrates. 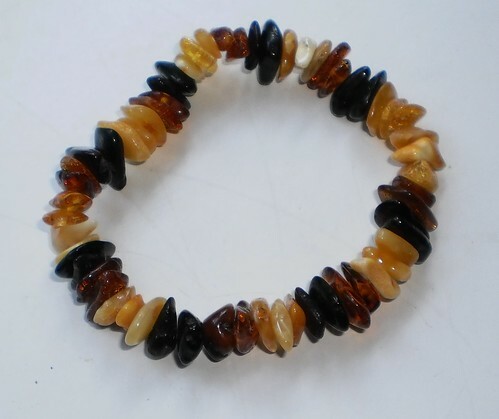 Much of the information on baltic amber's ability to help people in pain is, what would be termed, 'anecdotal' with no true studies anywhere, that I could find. Nevertheless, the evidence that I did find from a variety of sources lead me to believe it was something I wanted to try. 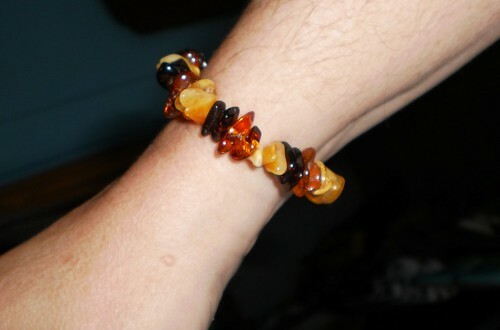 Last weekend, I spent a great deal of time looking over the offerings in the myriad of web sites with baltic amber available. The site referenced in the "Smile and Wave" post was offline or I probably would have made my purchase there. My search led me to Baltic Creations. Their web site is in sad need of a major overhaul. 'Garish' doesn't quite cover it. It's a bit tricky to navigate but once I figured it out, I could compare prices on pieces. You can find amber jewelry in the $1,000 price range, but it's guaranteed NOT to be of the medicinal version. Plus, in order to be of any good to you, the amber has to touch your skin. That's not going to happen with a chunk set in platinum. The information I read recommended, for arthritis, a bracelet was sufficient. So, I chose one because it looked cool online. It arrived today. I like the multi-colored stones. A couple sites said the more milky and light colored stones are higher in succinic acid than the dark ones but as long as it's all baltic amber, it's good. I cannot get this wet. If I care to, I can polish the stones with a bit of olive oil on a flannel rag. I need to make a flannel or velvet bag to keep this in when I'm not wearing it but I need to wear it all the time, except in the shower. That means at night, which will take some getting used to. It's the first of September. It seems appropriate to start a new treatment on the first of the month. This was $16 with no shipping costs. The beads are strung on a heavy duty elastic cord so it fits snug but not too snug. I'm not looking for pain free living. I believe I am always going to be living with some aches. If this helps me get up in the morning, then it will be $16 well spent. If it doesn't work, it's still pretty. I'm told to give it at least 2 months. Heck, I can do that. I've been tolerating this since April. What's another 2 months. Have any of my readers had experience with amber and healing? I'm interested to know your story.